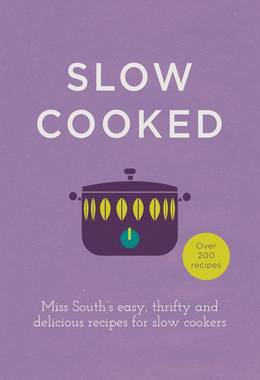 Learn how to make delicious Pho with this recipe from Miss South's Slow Cooked cookbook. 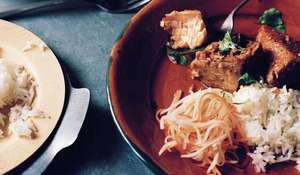 This healthy Vietnamese recipes makes a perfect light meal and can be prepared in a slow cooker. 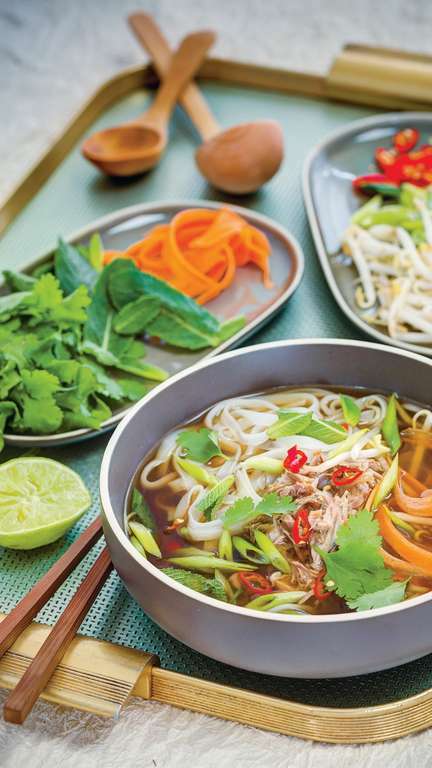 The Vietnamese national dish, this soup is just the ticket when you feel you’ve overindulged or need fortifying. 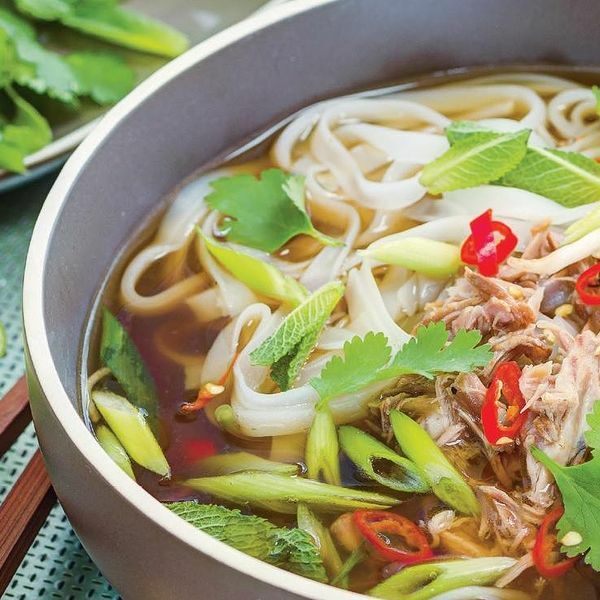 A rich, deep broth made from meat bones and filled with rice noodles, aromatics and fresh herbs, we’ve started a lovely trend in our house, encouraged by Mister North’s girlfriend Emma, to use the leftover bones and meat from a Sunday lunch or Christmas Day to make it. 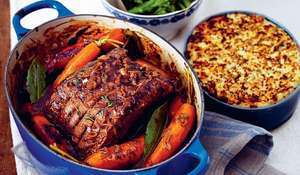 It’s traditionally a beef broth, but it works very well as a pork version too. I’ve made both several times and like them equally well. 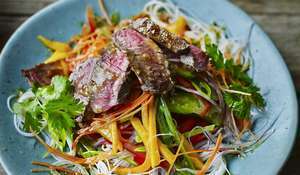 Pho (which is actually pronounced more like ‘fuhr’) is a great dish for lots of people as you can each customise your bowlful to your own tastes, making it very sociable. The pho requires a few steps before it goes into the slow cooker, but it’s still very easy. 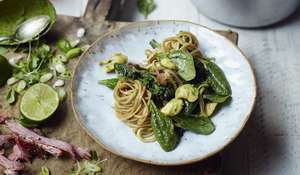 Put the onion, spring onions, ginger and whole garlic cloves into a very hot, dry frying pan or under the grill and allow them all to char and blacken slightly for about 5–7 minutes. 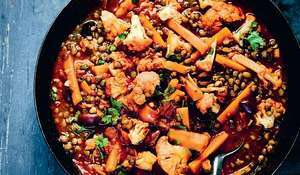 This charring adds fabulous flavour to the broth. If you have a gas hob, carefully use the flame to char them. Don’t allow them to cook and soften. 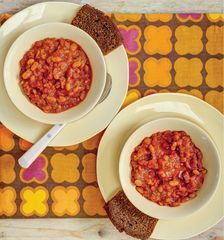 Put in the slow-cooker crock and set aside at this stage. 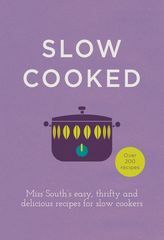 If you are using cooked bones from a roast, you can put them directly into the slow cooker. If you are using raw bones, put them into a large saucepan on the stove and cover with cold water. Bring the water to the boil and boil vigorously for 10 minutes. Skim as much froth and scum from the surface as possible. After 10 minutes boiling, drain the bones into the sink and rinse well with cold water so that you remove any impurities from the bones or the water you boiled them in. Remove little gristly or red bits and put the rinsed bones in the slow cooker. Add the star anise, cinnamon, cloves, Thai fish sauce and sugar and add the cold water. 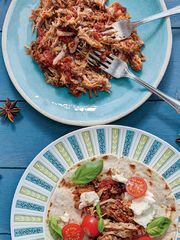 Put the lid on the slow cooker and cook the bones and aromatics together on low for 8–9 hours. At this stage, keep the heat on the slow cooker and remove the bones from the stock. 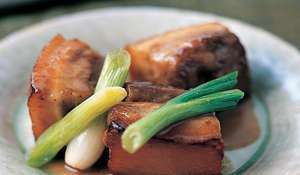 If you are using pork bones, set them aside to cool so you can remove the meat from them. You don’t need to do this with beef bones. Remove and discard all the charred aromatics and star anise and cinnamon. Taste the broth. 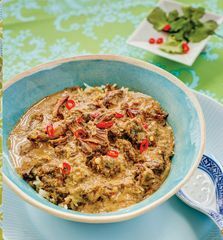 It should be rich with a meaty taste and a salty-sweet background flavour. Add some sea salt or a drop or two more Thai fish sauce, if needed. The long, slow cooking will have made the broth incredibly clear and tasty without accidentally boiling and becoming cloudy. Put the rice noodles into the still-warm stock. These are very thin, almost translucent noodles, which you can often buy for mere pence in the ‘world foods’ section of the supermarkets. They may be easier to find online if you don’t live near a large store. Put the lid back on the slow cooker and leave for 10 minutes to allow the noodles to cook. Slice the leftover beef into the bowls or strip the pork off the ribs into the bowls. Peel the carrot and, using the peeler, peel off thin ribbons of carrot. Put these in a small bowl. Add the bean sprouts to a small bowl too. Slice the spring onions and put in a small bowl. Shred the coriander and the mint and put in small dishes. Chop the red chilli and do the same. Cut the lime into wedges. Put all the bowls on the table in the centre. Ladle out some of the broth and the noodles into the bowls with the cooked meat in. Allow everyone to customise theirs with herbs, chilli and vegetables. Squeeze the lime over it all and slurp up your noodles with gusto. The soup is surprisingly filling, but incredibly satisfying and fortifying. I can’t eat mine with any decorum, only great joy.